Once you have your wort all brewed together, you’re going to need to a place to put it so that it can ferment. That raises the age old question of plastic fermenting bucket or glass carboy? Ok, maybe it isn’t an age old question, but it is a question that a lot of home brewers have asked. 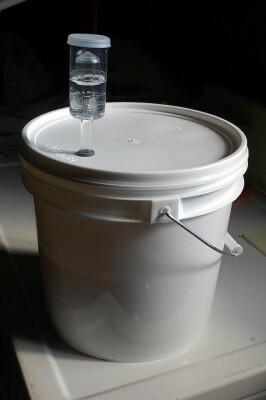 When I first started out homebrewing, I went with a kit that included a plastic fermenting bucket. I’m not going to lie, it was because the kit with a plastic bucket was a lot cheaper than one with a carboy. And that’s not the only reason that fermenting buckets are good to have around. They’re light weight and most of them come with a handle so they’re easy to carry around. Since they’re not clear like glass, you’re not going to end up with skunked beer. (However, I wouldn’t go around leaving any beer around a bright light source.) They also have a wide opening so they’re easier to sanitize and clean than something with a small opening like a carboy. However, there are some drawbacks to plastic buckets. They come with lids that can be hard to put on and seal completely. These same lids can also be a pain to take off. Plastic also scratches and bacteria love scratches so you have to be careful not damage them. Plus a plastic bucket, isn’t going to last forever, eventually it will scratch or crack and you’ll have to get a new one. I still have a plastic fermenting bucket hanging around, but now I also have a 6.5 gallon glass carboy. Not only does it look cooler than a bucket and allow you to watch the actual fermentation as it happens, but they also last a long time – years, probably even decades. Plus you can clean to your heart’s content without worrying scratching them. The plastic cork that goes in the opening is also usually easy to put in (unless it’s wet), take off and makes for a great seal. Of course, there are some problems with glass carboys too. They are glass so they can break and they can injury you if you’re not careful. They’re also more expensive than a plastic bucket. It’s also significantly heavier than a plastic bucket. Plus, they have just a small neck for an opening, which makes it a little bit more difficult to get in there and clean it. The pros and cons basically balance out plastic buckets and glass carboys, it comes down to your own preference. If you’re just getting into home brewing, there is nothing wrong with saving a few bucks and getting the fermenting bucket when you’re starting out. 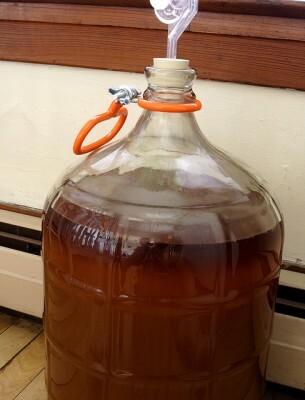 However, I have a feeling that at some point you’ll want a carboy. Photos by steve.wilson and timothy.holt.